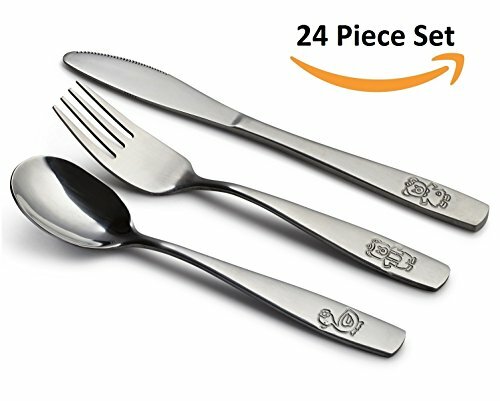 24 Piece Kids Cutlery Set will make it ease for your child to learn how to use eating utensils and exciting to have silverware like adults that are their size and safe. Specially Designed for Children's Size and Safety. This set of kid's flatware will last for years; your child will outgrow it before it begins to show signs of wear and tear! Set Includes 8 Knives, 8 Forks, 8 Spoons, Total of 8 Place Settings. 24 Piece - Stainless Steel Kids Cutlery, Set Includes 8 Knives, 8 Forks, 8 Spoons, Total of 8 Place Settings. The Perfect Gift for New Parents, Baby Showers, Baby's 1st Birthday, Easter, Christmas or any Event. Perfect Set for All Meals. 8 Forks, 8 Spoons, and 8 Knife. No Need to Keep Washing Dishes All Day. Fork Size: 5.75in x 1in, Spoon Size: 5.75in x 1.25in, Knife Size: 6.5in x .8in.